A centenarian is a person who lives to the age of 100 years. Because life expectancies worldwide are below 100 years, the term is invariably associated with longevity. In 2012, the United Nations estimated that there were 316,600 living centenarians worldwide. The Gerontology Research Group (GRG) is a global group of researchers in various fields that verifies and tracks supercentenarians, or people who are at least 110 years old in a list of the verified oldest people. The group also aims to further gerontology research with a goal of reversing or slowing aging. The Max Planck Institute for Demographic Research (MPIDR) is located in Rostock, Germany. It was founded in 1996 by James Vaupel and moved into new buildings in Rostock in 2002. It is one of approximately 80 institutes of the Max Planck Society. Geert Adriaans Boomgaard was a Dutch supercentenarian. He is accepted as the first validated supercentenarian case on record.</ref> Since there is evidence that he served as a soldier in Napoleon's Grande Armée, in the 33rd Light Infantry Division, Boomgaard might in fact have been the oldest military veteran ever for several decades. The term supercentenarian has been in existence since at least the nineteenth century. The term ultracentenarian has also been used to describe someone well over 100  – Norris McWhirter, editor of The Guinness Book of Records , used the word in correspondence with age claims researcher A. Ross Eckler Jr. in 1976, and it was further popularised in 1991 by William Strauss and Neil Howe in their book Generations . Meanwhile, semisupercentenarian has been used for the age range of 105–109 years. Early references to supercentenarian tend to mean simply "someone well over 100", but the 110-and-over cutoff is the accepted criterion of demographers. A. Ross Eckler Jr. was an American logologist, statistician, and author, the son of statistician A. Ross Eckler. He served in the US Army from 1946 - 1947. He received a B.A. from Swarthmore College with High Honors in 1950 and a Ph.D. in mathematics from Princeton University in 1954. Longevity claims are unsubstantiated cases of asserted human longevity. Those asserting lifespans of 110 years or more are referred to as supercentenarians. Many have either no official verification or are backed only by partial evidence. Cases where longevity has been fully verified, according to modern standards of longevity research, are reflected in an established list of supercentenarians based on the work of organizations such as the Gerontology Research Group (GRG) or Guinness World Records. This article lists living claims greater than that of the oldest person whose age has been independently verified, Kane Tanaka at 116 years, 73 days, and deceased claims greater than that of the oldest person ever whose age has been verified, namely Jeanne Calment who died at the age of 122 years, 164 days. The upper limit for both lists is 130 years. Jean-Marie Robine is a French demographer, gerontologist, author and journalist, who is best known as being the co-validator of the longevity of Jeanne Calment, the oldest verified supercentenarian of all time, with whom he collaborated. 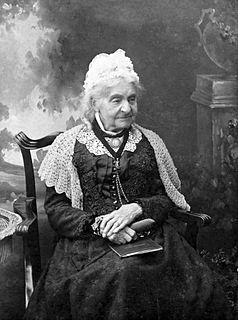 Margaret Ann Neve was the first recorded female supercentenarian and the second validated human to reach the age of 110 after Geert Adriaans Boomgaard. Neve lived at Saint Peter Port on the island of Guernsey in the English Channel. She was also the first proven individual whose life spanned three centuries. 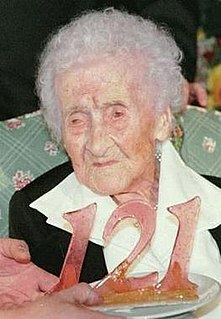 Jeanne Louise Calment was a French supercentenarian from Arles, and the oldest human whose age was well-documented, with a reputed lifespan of 122 years and 164 days. Her longevity attracted media attention and medical studies of her health and lifestyle. Over 1,500 supercentenarians have been documented in history. It is likely that more have lived, but the majority of claims to have lived to this age do not have sufficient documentary support to be validated. This is slowly changing as those born after birth registration was standardized in more countries and localities attain supercentenarian age. By measuring the biological age of various tissues from supercentenarians, researchers may be able to identify the nature of those that are protected from aging effects. According to a study of 30 different body parts from a 112-year-old female supercentenarian, along with younger controls, the cerebellum is protected from aging according to an epigenetic biomarker of tissue age known as the epigenetic clock — the reading is about 15 years younger than expected in a centenarian. These findings could explain why the cerebellum exhibits fewer neuropathological hallmarks of age-related dementia as compared to other brain regions. Leslie Stephen Coles was the co-founder and executive director of the Gerontology Research Group where he conducted research on supercentenarians and on aging. He was also a visiting scholar in the computer science department at the University of California, Los Angeles and an assistant researcher in the Department of Surgery, at the David Geffen School of Medicine. Coles had an M.D. and Ph.D.. The New England Centenarian Study is a study of persons aged 100 and over (centenarians) in the Boston area. It is one of the oldest, largest and most prestigious studies of its kind in the world. James W. Vaupel, is an American scientist in the fields of aging research, biodemography, and formal demography. He has been instrumental in developing and advancing the idea of the plasticity of longevity, and pioneered research on the heterogeneity of mortality risks and on the deceleration of death rates at the highest ages. Kane Tanaka is a Japanese supercentarian who at her age of 116 years, 73 days, is the world's oldest verified living person following the death of 117-year-old Chiyo Miyako on 22 July 2018. ↑ B. M. Weon & J. H. Je (2009). "Theoretical estimation of maximum human lifespan". Biogerontology. 10 (1): 65–71. doi:10.1007/s10522-008-9156-4. PMID 18560989. ↑ The Los Angeles Gerontology Research Group (30 September 2003). "Table E: Validated Living Supercentenarians as of September 30, 2003". grg.org. Archived from the original on 3 October 2003. Retrieved 24 April 2017. ↑ Gerontology Research Group (21 April 2017). "Table E: Current Validated Living Supercentenarians". supercentenarian-research-foundation.org. Retrieved 24 April 2017. ↑ Rosenwaike, Ira; Stone, Leslie F. (2003). "Verification of the Ages of Supercentenarians in the United States: Results of a Matching Study". Demography. 40 (4): 727–739. doi:10.1353/dem.2003.0038. JSTOR 1515205. ↑ Maier, H.; Gampe, J.; Jeune, B.; Robine, J.-M.; Vaupel, J. W., eds. (2010). Supercentenarians. Demographic Research Monographs. Springer. doi:10.1007/978-3-642-11520-2. ISBN 978-3-642-11519-6 . Retrieved 13 April 2017. ↑ CSMonitor Staff (10 August 2010). "Supercentenarians around the world". The Christian Science Monitor . Retrieved 13 April 2017. ↑ "Pre1850sGallery.html, as of October 3, 2016". www.grg.org. Retrieved 24 April 2017. ↑ "Death of a Super-centenarian". The Tralee Chronicle and Killarney Echo. 15 November 1870. Retrieved 5 February 2015. ↑ "The Doctors and the Microbes". The Inter Ocean. 10 October 1897. Retrieved 5 February 2015. ↑ Gibb, G. (1876). "Ultra-Centenarian Longevity". The Journal of the Anthropological Institute of Great Britain and Ireland. Royal Anthropological Institute of Great Britain and Ireland. 5: 82–101. doi:10.2307/2841365. JSTOR 2841365. 1 2 3 Anderson, Stacy L.; Sebastiani, Paola; Dworkis, Daniel A.; Feldman, Lori; Perls, Thomas T. (2012). "Health Span Approximates Life Span Among Many Supercentenarians: Compression of Morbidity at the Approximate Limit of Life Span". The Journals of Gerontology: Series A. 67A (4): 395–405. doi:10.1093/gerona/glr223. PMC 3309876 . PMID 22219514 . Retrieved 28 February 2014. ↑ Horvath S, Mah V, Lu AT, Woo JS, Choi OW, Jasinska AJ, Riancho JA, Tung S, Coles NS, Braun J, Vinters HV, Coles LS (2015). "The cerebellum ages slowly according to the epigenetic clock" (PDF). Age (Albany US) . 7 (5): 294–306. doi:10.18632/aging.100742. PMC 4468311 . PMID 26000617.